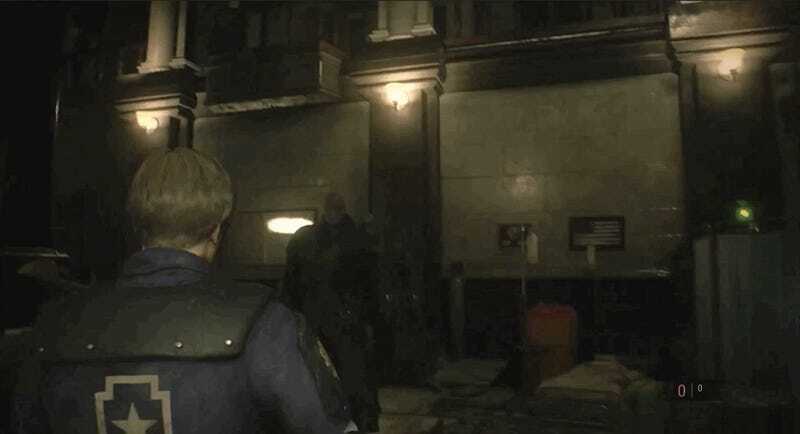 One of Resident Evil 2’s more surprisingly design details is that Mr. X isn’t simply summoned randomly to hound the player from time to time. Once he arrives in the Raccoon City Police Department, he is always patrolling the game’s map. You can see that in this episode of the YouTube show Boundary Break. That means that even while you don’t see him, he’s there. But this design quirk also creates some interesting possibilities, one of which is the ability to have two unstoppable death monsters chasing the player, like in this video by YouTuber Dan the Hitman. Getting this to happen is tricky. At its most basic level, glitching a second Mr. X into existence means keeping the first one nearby while hitting one of the few moments in the game where he is meant to arrive. In those moments, the game generates a Mr. X to pop in on the player. Those moments trigger when the player reaches certain areas or does a specific action, such as dousing the fire on a burning helicopter or reaching a certain spot near the STARS office in a second playthrough. In those moments, a player who has manipulated the patrolling Mr. X to be nearby or who has managed to go out of bounds can trick that Mr. X and the one tied to one of these trigger scenes to both show up. In Dan the Hitman’s, they glitch out of bounds to one trigger point for Mr.X and then solve a quick puzzle, which sets up another trigger that summons another trenchcoat-wearing Tyrant. That level of manipulation means that you’re more likely to see two Mr. Xes in already glitchy scenarios more than in casual play. Barring some glitching or a very unlucky chase from an already present Mr. X, players should only have to deal with one horrible zombie dude.